Have you honestly never heard of Star Lord? Don't you think his name implies that he might be worth knowing? Well, let us introduce you. He is, in essence, one of the coolest guys in all the galaxy—and if the lore is to be believed, we owe him our galactic existence! Ronan the Accuser got mad at Star Lord for nabbing an orb he's after, so Star-Lord formed the Guardians of the Galaxy to ensure the safety of the galaxy (from utter destruction). It's all very dramatic. But those series of events led to the formation of one of the coolest leagues of heroes since the Justice League, featuring Drax, Gamora, Groot and Rocket Raccoon! 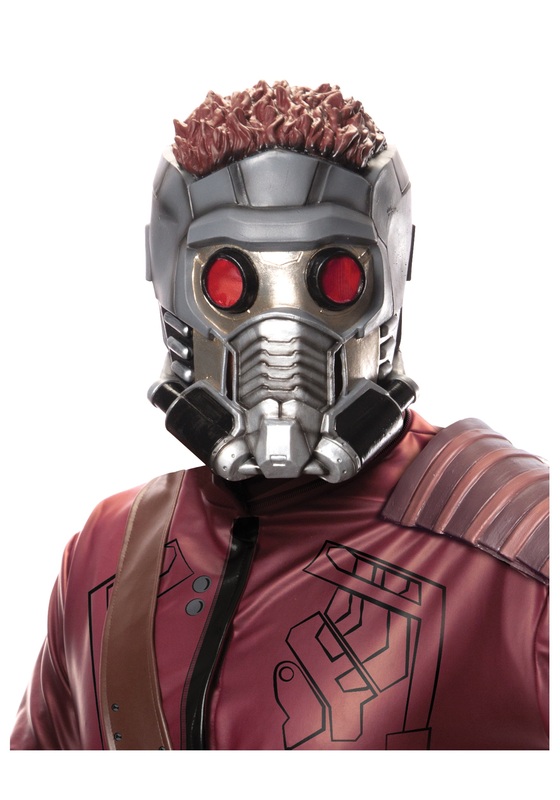 You can wear this Adult Star Lord 3/4 Mask and become the interplanetary leader, inspiring reverence in the hearts of all beings galaxy-wide! It's latex and comes with red mesh over the eye holes, so you can keep a relaxed eye out for the occasional supervillain. But in that case, just call in the Guardians. It works but smells and is hard to see out of. Liked the mask that came with the costume better.